There's plenty to see before a full solar eclipse in 2024. After witnessing the great American total solar eclipse in August, almost anything that nature can throw at us as a celestial event would pale in comparison. Nothing can match the sheer power, beauty, dramatic, all-encompassing and totally unforgettable action of the perfect alignment of our two most familiar celestial companions. But there will be two more total solar eclipses in South America just two and three years away, and another total solar eclipse will cross this country, including Maine, on April 8, 2024. Until then the sky is always changing and always producing great beauty, that anyone and everyone can enjoy at any time of the day or night, so you don’t need to travel great distances to watch any one particular event like I did last month. The more you understand about what’s really going on in the sky, the more you will appreciate it and enjoy it, which in turn will lead to more understanding and practical application that also will spark your imagination. Highlights this October include both of our next-door planetary neighbors, Venus and Mars, dancing in the morning sky, an occultation of Regulus by the moon, the opposition of a large asteroid – Pallas and the opposition of the planet Uranus – several close conjunctions, and a very nice Orionid meteor shower. Not a bad lineup for an average month that doesn’t fall into an eclipse season. The next good total lunar eclipse visible for us over New England won’t be until Jan. 20, 2019. Venus will start the month rising about two hours before the sun and Mars will follow just 3 degrees behind. You may need binoculars to see Mars because both of our neighbors are at their farthest and dimmest this month. Mars is now over 200 times fainter than Venus, and has the same apparent width as the Uranus that’s at opposition, but is still nearly two billion miles away. That’s only halfway through our solar system, since Pluto is about four billion miles, or 40 astronomical units, away. Keep watching this pair dance in the morning sky as Mars overtakes Venus about a week later. Mars will keep rising earlier, again getting closer to Earth on its way to a very good opposition in July 2018 that will rival the great close opposition of Aug. 27, 2003. Mars only reaches opposition every 26 months. Venus is fully illuminated by the sun now, but it is at its least brightest because it’s so far away and close to the sun at superior conjunction. We will lose Venus next month, then it will show up again in our evening sky. The moon just occulted Aldebaran last month. Even though it was a daytime event for us, it was visible through a good telescope. The waning crescent moon will occult Regulus during dawn on Oct. 15. Remember that the sun was very close to Regulus in Leo last month when it was completely covered by the moon. It caused its atmosphere or corona to blaze forth in all of its ethereal beauty and completely dominate the sky for 21/2 minutes, turning a brilliant sunny day into night in a split second. Hundreds of millions of Americans, and many people from far and wide across our globe witnessed at least part of this great and rare event. It’s estimated that at least 25 million people were right in this narrow path at that time. About 12 million people already lived there and about the same number traveled there to put themselves exactly in the right place and time to witness something totally indescribable in its essence. You can certainly try to describe it and remember it, but it’s an individual experience, the true beauty of which is completely constant, yet ever-changing and ineffable, suspending and transcending both time and space as a moment in celestial eternity. Our third-largest asteroid, Pallas, will be at its best on Oct. 29 at 8.3 magnitude in Eridanus the River, making it visible in a good pair of binoculars. Ceres and Vesta are our two largest asteroids. Uranus will be at opposition on Oct. 19 in Pisces the Fish. It will shine with an interesting blue-green light at 5.7 magnitude, technically visible to the naked eye, but you should use binoculars to find it easily. It will rise at sunset and not set until sunrise. Neptune is just past opposition now in the next constellation over to the west, Aquarius, but it is six times fainter at magnitude 7.8. Watch a slender waning crescent moon pass right between Mars and Venus in the eastern morning sky one hour before sunrise on Oct. 17. A waxing crescent moon will pass near Antares and then Saturn in Scorpius one hour after sunset on the night of the Oct. 22 through Oct. 24. The annual Orionid meteor shower will peak on Saturday night the 21st into the next morning. The moon will be new so it won’t interfere. You can expect about 20 meteors per hour from a good dark sky site. The southern hemisphere can expect twice that many. You will be seeing tiny, sand-grain-sized pieces of Halley’s Comet burning up 70 miles high in our atmosphere as they come screaming in at about 40 miles per second. This most famous of all comets causes two major meteor showers each year because we pass through its debris trail twice each year. The other time is around May 4 for the Eta Aquarids. We will lose Jupiter low in the western sky after the first few days this month. Then it will show up again in the morning sky in early November. Oct. 1: On this day in 1897, the Yerkes Observatory was dedicated. I took a tour of this great observatory on Lake Geneva in Wisconsin on my recent eclipse trip. Its 40-inch refractor, the largest telescope in the world at the time and still the largest refractor in the world now, was designed by George Ellery Hale. He then went on to design the next three largest telescopes in the world, culminating with the 200-inch reflector at Mt. Palomar in 1948. Oct. 4: In 1957 the Russians launched the first man-made satellite ever, Sputnik 1, beginning the space race. Oct. 6: Full moon is at 2:41 p.m. This is usually called the Hunter’s Moon, but this year it falls just a few days closer to the fall equinox than September’s full moon, so it is also the Harvest Moon. Oct. 7: Niels Bohr was born in 1885. He came up with a more accurate model of the atom and was a very important early pioneer of quantum mechanics, which essentially makes possible most of our modern conveniences including computers and cell phones. Oct. 12: Last-quarter moon is at 8:25 a.m.
Oct. 19: New moon is at 3:12 p.m. This marks two months since the great eclipse. 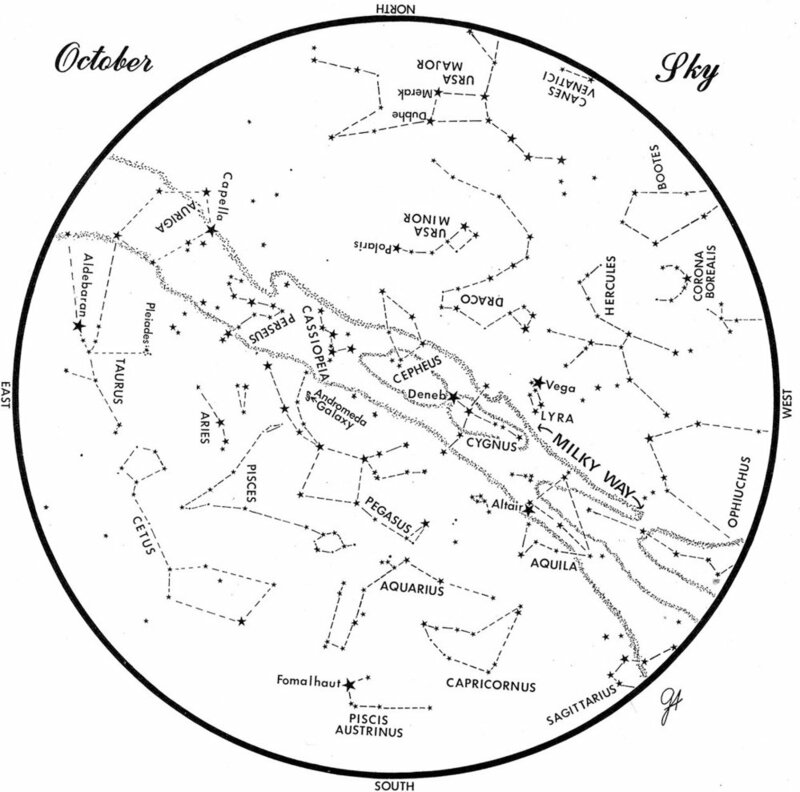 Oct. 21: The Orionid meteor shower peaks this morning. Oct. 27: First-quarter moon is at 6:22 p.m.
Oct. 31: On this day in 2005, the Hubble Space Telescope discovered two new moons of Pluto, Nix and Hydra. Its largest moon, Charon, half the size of Pluto, was discovered in 1978. Only two more moons would be found, Kerberos in 2011 and Styx in 2012. All five of its moons have strange resonances and probably were formed when a large object hit Pluto over four billion years ago. New Horizons made many great discoveries at Pluto when it flew very close by on July 14, 2015, but it didn’t find any more than those five moons.